I saw the movie Elysium this afternoon. It’s a tale of a desperately poor population living under the rule of an elite wealthy class. In this case, the poor are living on Earth and the wealthy elite in a space habitat called Elysium. The habitat has technology able to cure any ailment, but this technology is reserved for use only by the citizens of Elysium. People from Earth periodically attempt to land on Elysium. Most are either shot down before landing, or deported if they do manage to arrive. Some are motivated to do this to get to the healing machines, although they can only use them if they’ve have an Elysium citizen identification branded on their arms, which a few are able to obtain illegally. Max, the main character played by Matt Damon, is on Earth. The movie shows him as a boy looking up at Elysium and dreaming of going there. As an adult, he receives a lethal dose of radiation at work in a factory, giving him only a few days to live. The balance of the movie is about his attempts to get to Elysium for healing and his resulting entanglement in a coup attempt on the habitat. I found the Elysium habitat itself interesting. You don’t see space habitats often in science fiction movies (although they are common in sci-fi literature). At first glance, the Elysium habitat seemed to be a Stanford style torus, but then we see it has an open design with shuttles landing directly on it’s inner surface. This would mean it would have to be far larger than a Stanford torus, which the movie implies by having it visible from Earth. It makes it more like a miniature version of the orbital in Iain Banks‘ Culture novels. Of course, like all but a handful of science fiction movies, most of the science is ludicrous and we shouldn’t anticipate that the habitat is sized correctly. Still, it was cool to see it included. The Earth scenes mostly take place in hispanic neighborhoods in Los Angeles, most of the Earth characters are hispanic, and the ships we see destroyed while trying to land on Elysium are carrying poor hispanics which are referred to as “illegals”. So the social commentary here is fairly obvious, albeit right on the mark in many ways. I think both Matt Damon and Jodie Foster did a good job with their characters. 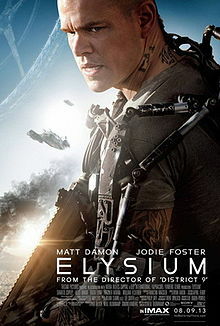 Foster plays Elysium’s security chief charged with keeping the habitat secure from Earth illegals attempting to get in. I would have like to have seen her character get a little more development, but I guess the movie wasn’t long enough for it. Overall, I enjoyed the movie, although it wasn’t quite as good as I had expected from, Neal Blomkamp, the director of District 9. If you haven’t seen it yet, like science fiction movies, particularly if you enjoyed District 9, then I would recommend it. This entry was posted in Science Fiction and tagged District 9, Earth, Elysium, Iain Banks, Jodie Foster, Los Angeles, Matt Damon, Science fiction, science fiction movies, space habitat. Bookmark the permalink. My pleasure, and thanks for stopping by!